This tutorial is an introduction to the concept of exposure in photography. Exposure is the heart of photography. In order to excel in your photography career, you must have a firm understanding of what exposure is and how it works. In this article I will discuss what exposure is and the three main components of exposure, ISO, Shutter Speed and Aperture, also known as the exposure triangle. Step 1: What is Exposure? What Happens When You Take A Photo:When you take a photo, you are recording a moment of light. Exposure is the heart of photography – it is the technical process of recording light. To understand exposure, you must understand what photography is. What are you doing when you take a photo? What happens when you press the shutter button on your camera? When you “take a photo” you are recording a moment of light. The technical process of recording light is called exposure. Exposure can also mean the actual single instance of the recording of light. So when you are taking a photo, you can also say that you are taking an exposure. You record light by “exposing” the “recording device” of the camera (film, imaging sensor) to light. The total amount of light that is recorded is dependent on three key factors: how much light is recorded, how long is that light exposed and how sensitive is the recording device to that light. Let’s take a closer look at each of these three components. In film photography, ISO is the sensitivity of the film to light. In digital photography, ISO is the sensitivity of the imaging sensor to light. So we can say that ISO is the sensitivity of the “recording device” (film, imaging sensor) to light. ISO is represented in terms of numbers from below 100 to the thousands. The higher the number, the greater the light sensitivity. Conversely, a lower ISO number means a lower light sensitivity. What we mean by sensitivity to light is that, all other variables being equal, the total amount of light that is required to properly record an image. HIGHER ISOs require LESS light to record an image. LOWER ISOs require MORE light to record an image. You can see how you can make use of this in your photography. For example, in lower light situations, you can increase your ISO to get a good exposure. Shutter speed is perhaps the simplest of the three concepts to understand and refers to the duration that the light is recorded onto the recording device. In other words, how long is the light allowed to stay on the film or imaging sensor. This can range from thousands of a second to hours. As you can probably tell, the slower the shutter speed, the longer the recording device is exposed to light, and all variables being equal, the less light is needed to record an image. If you have LESS available light, then you will need a SLOWER shutter speed to get a good exposure. If you have MORE available light you have, the FASTER the shutter speed that you need to get a good exposure. In our analogy above, aperture is how much light is being recorded onto the recording device. The term “how much” can be a bit confusing. To give you a better understanding, think of aperture as representative of the “flow of light” that is being recorded. We control this flow of light by controlling the diameter of the aperture, or the opening of the lens. A smaller opening means that less light will “flow” through the lens. A larger opening means that more light will “flow” through the lens and onto the recording device. Now for the more confusing part about aperture. In photography, aperture is represented as an f-number, typically known as an f-stop. This ranges from f/1.0 and below to f/22 and above. What is confusing is the inverse relationship between the f-number and the aperture. The SMALLER the f-stop, the LARGER the aperture, or opening of the lens. The LARGER the f-stop, the SMALLER the aperture, or opening of the lens. What this means is that if you have a smaller f-stop, you have a larger aperture (diameter of opening of the lens), you will have more light flowing onto the recording device and therefore, need less time to expose the image. The SMALLER the f-stop, the LARGER the aperture (opening of the lens), the MORE light is allowed onto the film or digital sensor, the FASTER the shutter speed and/or LOWER ISO you need to get a proper exposure. The LARGER the f-stop, the SMALLER the aperture (opening of the lens), the LESS light is allowed onto the film or digital sensor, the SLOWER the shutter speed and/or HIGHER ISO you need to get a proper exposure. If the above statements are confusing to you, please re-read them to make sure you understand what the interplay that is going on. The Exposure Triangle: Is the interplay between ISO, Shutter Speed and Aperture. 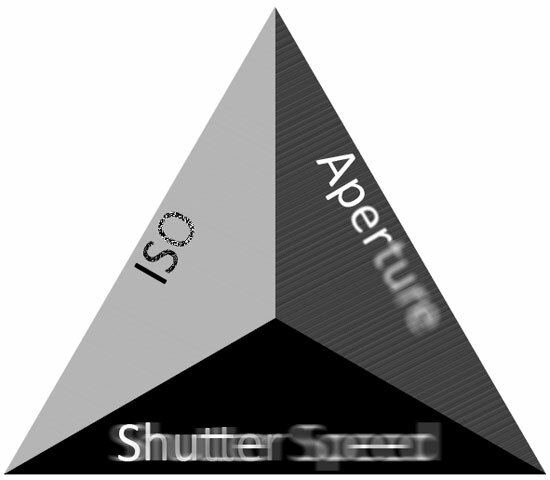 The exposure triangle is the relationship between the three components of exposure: ISO, shutter speed and aperture. As you can tell, changing one aspect of exposure induces a change in one or two of the other aspects. There is an interplay between ISO, shutter speed and aperture. The more comfortable you get with these three components, the more you will be able to control the quality of your photos. An example might help to clarify the relationships of the exposure triangle. Imagine we want to get a good or “proper” exposure of a particular subject. Now imagine that this is a controlled shot, so that the only variables we can change are the ISO, shutter speed and aperture. All other variables remain constant. If we use a large aperture (small f/stop number), then we will need a faster shutter speed (shorter duration of exposure), and we can use a lower ISO (lower light sensitivity). If we use a slower shutter speed (longer duration of exposure), then we will need a smaller aperture (higher f/stop number), and we can use the same ISO. If we change the ISO and use a higher ISO (greater light sensitivity), then we can use a smaller aperture and/or faster shutter speed. See if you can make out other relationships for yourself. If you understand the principles explained so far, you may be thinking there are other ways to control the total amount of light that a recording device gets “exposed” to besides with just ISO, shutter speed and aperture. You are correct. The other side of the equation is to control the incoming light itself! Lighting is a whole other aspect of photography that we will explore in future tutorials. 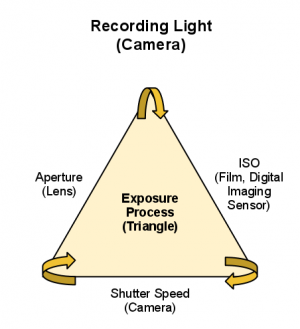 The Exposure Process: In photography, the recording of light is the exposure process which is necessary to convert incoming light into a photo. We now know that exposure is the technical process of recording light. In other words, exposure controls the total amount of light that is recorded. The total amount of light that is recorded is controlled by three components of ISO, aperture and shutter speed. ISO controls the recording device’s sensitivity to the incoming light. Shutter Speed controls the duration that the light is exposed on the recording device. Aperture controls how much, or the flow of the incoming light onto the recording device. All three components control the total amount of light that is being recorded. This process of recording light is called exposure. The other way that you can control light is to control the light itself.